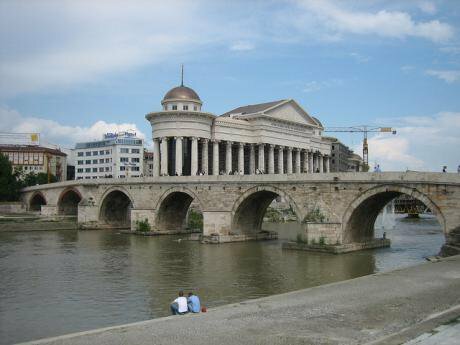 Skopje's Stone Bridge. Prince Roy/Flickr. Some rigths reserved.In the Polish town of Sejny, theatrical producer and social activist Krysztof Czyzewski is creating bridges that cross the divides among the local Polish, Lithuanian, Roma and other communities. His Borderlands Foundation, active since 1990, is using the power of interethnic communication to ease the tensions present in this small town. According to Czyzewski, such tensions are an inherent part of living together within what he calls the ‘borderlands’: places where people belonging to various ethnicities and religions inevitably meet each other. Rather than trying to get rid of them, he seeks to encourage individuals to go beyond communal borders and learn ways to moderate ethnic tensions through communicating with members of other groups. Sejny is only one of the many examples in Europe where communication between different ethnicities is desperately needed. Skopje is another. The key problem in the latter however is that the Macedonian government seems to have little interest in fostering interethnic communication. Inversely, it relies on nationalistic rhetoric and promotes policies that encourage interethnic tensions. In Macedonia, the idea of ethnicity is, at the moment, simply being exploited by the ruling parties so as to maintain an unaccountable and illegitimate system of power. However, students might bring about change. Recently, they took to the streets following yet another interference by the government in university independence. Protesting together, with slogans in different ethnic languages, students shared a common message. Without needing to put aside their ethnic identity, the students were able to recognize their common concerns and voice them with united vehemence in the streets of Skopje. Interethnic communication, we believe, is essential because it gives all citizens the possibility to take part in discussions about the public good, without ignoring their ethnic background yet not making it central when common interests are at stake, and especially when political accountability is needed. Interethnicity is perhaps easier to define negatively: by what it is not. It does not give privilege to any single ethnic group over others, however it does understand and recognize the existence of different groups within society. It does not subscribe to the view that we should isolate and strengthen these groups (and thus conserve the power relations within them). Rather it is aimed at opening up as many alleys of communication between the members of these groups as possible, and help to sustain them. Recognition of difference is not seen as an objective in itself but rather as a basic condition for communication. Interethnicity is about offering members of different ethnic groups means to overcome the divisions among them through communication. In our view, states grappling with the challenges of multiethnicity, should focus their efforts towards building channels for communication between different ethnic groups. However, addressing the issue at the institutional level is not straightforward, especially where governments have nationalistic tendencies. We believe therefore that the interactions between different ethnic groups could be a bottom-up start of communication, especially when essential interests of daily livelihood are at stake. These interactions could produce a demand for political action, and those demands could possibly be effectively turned into political power and state policy through the channels of political representation. After all, such positive examples already exist. In Slovakia, a political project by the name of Most-Híd was formed in 2009. Most-Híd (“Bridge” in Slovak and Hungarian) is grounded in the idea of interethnicity: dubbing itself the party of cooperation it seeks to address both Hungarian and Slovak voters, and addresses issues important to both constituencies. The internal structure of the party is also interethnic, with local groups’ membership mirroring the ethnic composition of their particular settlements. Regional and national level organizations within the party are also free to use any language that they see fit, and there are no ethnic quotas (with the notable exceptions of the vice chairpersons, where a symbolic parity of 1:1 is sought). With a score of 8.3 percentages in the 2010 parliamentary elections, just months after its launch, Most-Híd shattered the formerly ethnic-based electoral system. Most-Híd’s agenda therefore departs from, and in some ways rises above, the traditional notion of nation-state politics. By promoting the spirit of interethnicity, it looks to build upon the grassroots experience of the people living in the borderlands, and to take steps so that such experience is reflected in government policy. The time is ripe to make ethnicity part of citizens’ identity and not an obstacle for their interaction with each other and state institutions. Communication in this process is key and sometimes indeed it starts in the streets.